The "Stack" in the name is okay. As long as your app don't sound like or look like it is owned by or endorsed by Stack Overflow Inc., you're good. • Do name your application with something unique. Including one of the terms, "Stack" or "Exchange" or "Overflow" in your product name is generally okay. It looks okay to me, too because no reasonable person would think they are using Stack Overflow. It looks like an application tailored to the device, and that's the point. The API is designed to create diverse apps to make them really kickass your specific platform. If you stay away from just cloning the site or looking like you're an official Stack Overflow application, you're good. I strongly suggest reading the iPhone Human Interface Guidelines (available on the dev portal) as well as researching the ways in which similar successful apps display their data. There's nothing better than apps that have had effort put into their user interface, both in terms of intuitiveness and polish. Especially on an Apple operating system. The mock up you have made is poor (as anything more than a layout idea) compared to some of the quality user interfaces available, such as the Digg app. I would use that and others as inspiration. Not only for layout, but also visual polish. 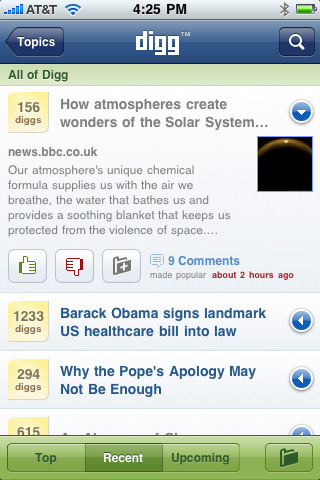 Have you seen the Digg.com official iPhone app? You could take some inspiration from that in terms of custom UITableViews. Obviously the thumb icons would go. Not the answer you're looking for? Browse other questions tagged discussion obsolete iphone .